Being invited to give a series of three lectures on this wide ranging topic at a seminar at the Universita di Ca’ Foscari in Venice in July 2016, it seemed a good opportunity to write a blog highlighting the interesting material in the British Library. Here are discussed such images in Mughal and Deccani painting. Yogis and other types of ascetics are found in Mughal illustrated historical manuscripts showing encounters recorded in Mughal histories between the emperors Babur, Akbar and Jahangir; and also in indivdual album paintings. From the Mughal point of view more or less all Hindu ascetics were classed as yogis since they all practised bodily asceticisms of some kind or another. The Mughal concern with naturalism towards the end of the reign of Akbar to some degree accounts for what appears to be the accuracy of the early Mughal images of ascetics and yogis. Early Mughal pictorial representations of yogis have as Jim Mallinson points out (Mallinson, “Yogis in Mughal India”) enormous value as historical documents on account of the accuracy and consistency of their detail, overwriting in many instances what can be gleaned from the conflicting literary traditions. It is obvious, he writes, that a variety of traditions shared ascetic archetypes and freely exchanged doctrines and practices. In the account in his autobiography, the Baburnamah, of his first raid into Hindustan in 1505, Babur, the founder of the Mughal dynasty in 1526 when he overthrew the Lodi Sultans of Delhi, mentions the well-known cave of Gurkhattri near Bigram (Peshawar) with its then-famous great banyan tree: ‘It was a holy place for yogis and Hindus, who came from faraway places to cut their hair and beards there’, but did not visit it at that time. In 1519, in the course of another incursion, he managed to visit it. ... reaching Bigram, went to see Gurh Kattri. We entered a small, dark chamber like a monk’s cell and after passing through the door and down two or three steps, we had to lie down to get in. It was impossible to see without a candle. All around was an unending pile of hair and beard that had been clipped there. Many chambers like the ones in madrasas and caravansaries surround Gurh Kattri. The first year I came to Kabul ... I went to the great banyan tree in Bigram and was sorry not to have seen Gurh Kattri, but it turned out not to be much to be sorry for. The sacred site at Gurkhattri was clearly in the hands of the Nath yogis, followers of Gorakhnath’s Hathayoga system. Nath yogis can be distinguished by the horn worn suspended round the neck, by the fillet worn round the top of the head and in their leaders by the necklace suspended from the shoulders to which are attached strips of cloth. They also wear cloaks often patched, but they do not have any sectarian marks, although they later became Shaivas. Note that at this stage Nath yogis wear hooped earrings through their earlobes and have not yet become the Kanphat or Split-ear yogis who split the actual cartilege of the ear. Other characteristics that mark them out is their long matted hair, piled up into jatas or loose, their nakedness or nearly such, and the smearing of their body with ashes. Note also the yogapattas or meditation bands and the fact that some seem still to wear the sacred thread. Alongside these historical manuscripts individual album paintings were also being produced in the Mughal studio in Akbar’s reign. Some of them poke fun at the ascetic tradition as had long been traditional in Indian culture, as in Basavan’s study from around 1585 of a poor shepherd offering flowers to a grotesquely bloated ascetic as he stalks by unheeding; he is followed by an acolyte whose body is as thin as his master’s is the reverse. By 1605 studies of yogis had become so commonplace that they could be added to the marginalia round illustrated manuscripts, as with this nearly naked Nath yogi tending his fire, complete with horn and earrings, from a manuscript of the Divan of Hafiz that was copied by Sultan ‘Ali of Mashhad but beautified with marginal studies at the beginning of Jahangir’s reign. Pictures of yogis were especially useful for Mughal artists since their nakedness could be used as an exercise in depicting the volumes of the human body or alternatively their voluminous robes for an exercise in modelling. 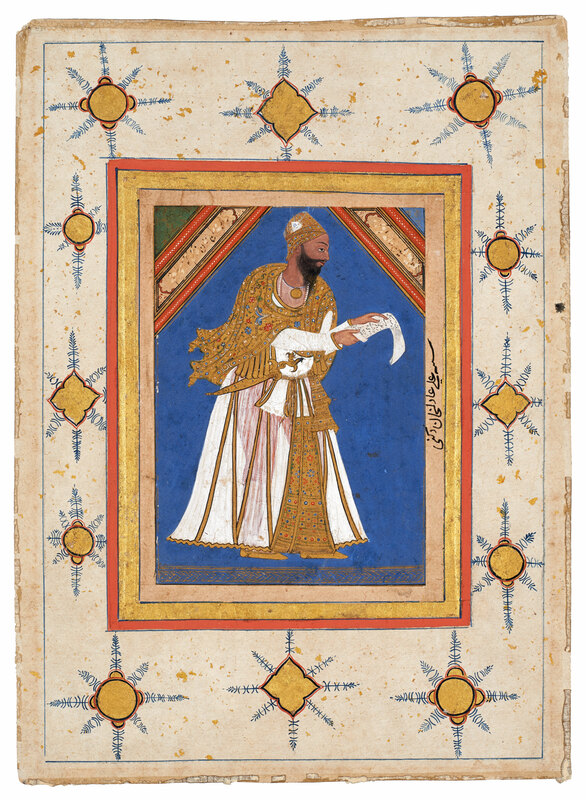 Although Akbar was interested in all religions and especially those of his Indian subjects and of course had numerous Sanskrit texts translated into Persian, it is his son Salim afterwards Jahangir who seems to have had a specific interest in yoga and ascetic practices, although the Library has no representations relevant to Jahangir here. Instead there are several studies of Nath yogis and other ascetics living in remote places (for example Falk and Archer, Indian Miniatures in the India Office Library, nos. 25-27, 45-46). It was Jahangir’s grandson, Dara Shikoh, the eldest son of Shah Jahan, born in 1615, who was most famously involved with Hindu philosophy and ascetics. Here are two facing pages from Dara Shikoh’s Album, compiled in the early 1630s just before his marriage, showing two ascetics in yogic postures, attributed to the great artist Govardhan early in his career around 1610. Both wear long beards and have their uncut hair twisted up on to their head: the one of the right has a Vaishnava sect mark and holds up a manuscript page, the one on the left holds a rosary. Govardhan’s famous study from the 1630s, formerly in the Cary Welch collection, of four nearly naked ascetics seated beside a fire seems to have served as inspiration for this study of Nath yogis by Mas’ud, which reproduces in mirror reverse Govardhan’s shrine on the hill and the tree with a group of ascetics seated before a fire. A young ascetic is bringing them food. Dara Shikoh is often represented in later paintings meeting ascetics, normally Muslim ones such as Mian Mir and Mulla Shah, but occasionally also Hindu as here. The accompanying inscription suggests that this is Dara Shikoh with La‘l Sahib, who was born in Malwa in the reign of Jahangir, among whose disciples was Dara Shikoh. The ascetic however in his white robe patched with pieces of variously coloured cloth, his sacred thread and his particular turban with a black fillet wound round a white kulah appears again in an important mid-17th century painting in the V&A Museum showing ten earlier Hindu mystics seated outside a Sufi shrine, where he is named as Kamal and seated beside his supposed father, the 15th century religious reformer Kabir. Both paintings are reproduced in Binyon and Arnold 1921, pls. XVII-XIX and XXII, who note that the two figures are the same but separate their identities according to the inscriptions. Kamal is mentioned in various hagiographical accounts of Kabir’s life and appears more of a spiritual than a biological son, but if he lived it was certainly earlier than Dara Shikoh. His presence here with Dara Shikoh adds weight to Elinor Gadon’s supposition (Facets of Indian Art, p. 157) that this prince was the patron of the V&A picture. Artists in the Deccani studios were no less interested in portraying yogis than their Mughal counterparts, and they also developed the artistic idea of the female yogi or yogini. The Library’s only 17th century image of a Deccani yogi is this magnificent and engimatic study of a royal ascetic wearing the patchwork robe of a yogi, seated on a tiger skin beside a fire and with the crescent moon linking him with the great yogi Shiva himself. His sword, dagger, club and fakir’s crutch (no less useful as a weapon than a support for meditation) suggest he might be one of the warrior ascetics who roamed India in bands in the 17th and 18th centuries. Yogis and ascetics continued as the subjects of paintings in the late 18th century, but now from the schools of Bengal and Awadh. Images of female ascetics became increasingly common in the later 18th century. They normally wear long gowns and have their hair piled up on top of their head or wear a turban. They live out in the open with other yogis and attracted devotees just as did their male counterparts, as in this example from the variation of the Awadhi style from Farrukhabad in western UP. Here a group of women have brought fruit and flowers to such a one, watched by other ascetics. A small śivalingam beside her being perpetually lustrated indicates her orientation. In another painting from Murshidabad, a noblewoman has brought her child to a hermitage where live two male ascetics, one old the other young, who sit there telling their beads, while a female ascetic, naked to the waist, supports herself on a swing and smokes from a nargila. The fire beside her suggests she is undergoing mortification, standing up supported by the swing while she exposes herself to the heat of the fire. Female ascetics leaning on swings are a feature of several other late 18th century paintings. The whole concept of Hindu female asceticism in India has only fairly recently become the focus of scholarly attention, specifically of anthropologists studying modern communities, but unless we are to believe that these pictorial studies are fantasies, then it clearly is a phenomenon known for several centuries.